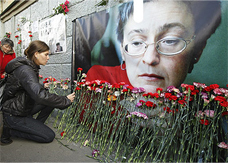 Unsuspected developments in the 2006 murder case of muckraking Russian journalist Anna Politkovskaya flooded the Russian media on Wednesday, after years of meager progress in the case took it largely off the radar. Politkovskaya’s death catapulted Russia into the spotlight as one of the world’s deadliest countries for reporters. Over the past five years, blame has been cast at Chechen militants, Chechen President Ramzan Kadyrov, Russian then-President Vladimir Putin, and Russian police officers, among others. But today, Russia’s Investigative Committee announced that ex-Lieutenant Colonel Dmitri Pavlyuchenkov had been arrested as the suspected organizer of the journalist’s murder. Investigators say that Pavlyuchenkov, who was at one point a main witness in the Politkovskaya case, was paid to organize the hit and even provided the criminal group in question with the murder weapon. An answer to the larger question of who paid Pavlyuchenkov also may be close at hand, as the Investigative Committee additionally announced that it had information regarding the murder’s “client.” According to RIA Novosti, the name of the suspect is under wraps for now in order to prevent complications with the investigation. Editors at Novaya Gazeta, the newspaper where Politkovskaya worked, said the news matched up with the results of their own independent investigation. At the very least, Novaya Gazeta’s investigation found that Pavlyuchenkov definitely played a key role in organizing the murder, said Sokolov. “I can’t say if he was the only organizer; there could have been two. But that this man was one of the main organizers and used his position [to ensure the murder was carried out] can already be confirmed,” he explained. “We and Novaya Gazeta, as victims, carried out our own research, collected evidence in the case and more and more came to the conclusion that he was involved in the crime and should not take the stand as a witness,” said Anna Stavitskaya, lawyer for Ilya and Vera Politkovskaya. For more information about the developments and background in the Politkovskaya case, see Radio Free Europe/Radio Liberty.